At first glance, Mai Kawasumi seems to be a taciturn and unapproachable, but otherwise perfectly mundane high-school student. That is, if one can overlook her habit of prowling the school corridors at night with an entirely genuine sword in her hands. Her explanation, “demon hunting”, breeds as much fear as it does outrage. It is no wonder, then, that as her notoriety grows, she is left alone... almost. What becomes a lifeline for Mai is her unconditional friendship with Sayuri Kurata, an eternally high-spirited girl from a rich family, and a new acquaintance with the recently-transferred Yuuichi Aizawa. Together, they enjoy the simple pleasures of life, bringing to light Mai’s love of animals, taste for good food and even... sense of humor. Those happy days cannot continue forever, though. Reality catches up to Mai as the demons she had fought start attacking her friends, threatening to take away from her what she values above her own life. In the face of tragedy, Mai’s resolve is turned into steel. She sets out to finish her crusade once and for all. As the number of remaining demons dwindles, Mai faces her past and the truth about the creatures she slays. But when she and Yuuichi finally bring the quest to an end… will Mai be able to face herself? 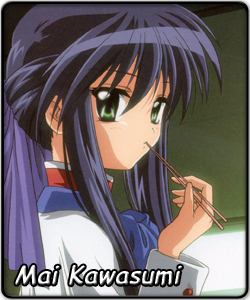 It may have been her reputation for breaking windows at school, or it may have been just dumb luck, but the randomized pairings went against Mai in her 2007 campaign. In Saimoe Japan 2007, Mai struggled in her first round against Mawari Zenigata (Seto no Hanayome). Although she did win by 141 votes, a win like that in the first round means you probably won't be making it far. And did Mai get some tough luck in her second round pairing - she ended up being tripled with Louise Francoise (Zero no Tsukaima). The battle was intense, but she ended up losing by only two votes. It was close, but in the end, Mai had to feel the disappointment of not being able to join her best friend Sayuri, who eventually went on to finish 15th. Louise would eventually move on to finish in the top 8.
in the next round, and suffered a heartbreaking loss - instead of moving on to a possible top 16 finish, an 85 vote margin against her favor forced Mai into a 30th place finish. Mai received an invitation to the first Korea Super Best Moe to be held, but because Sayuri finished outside of the top 32, Mai had to go alone. In a preliminary group against a hot-streaking Suigintou (Rozen Maiden) and 2006 Korean finalist Eri Sawachika (School Rumble), Mai struggled once again, and although she was able to take care of many promising opponents, including 2007 Korea Best Moe 4th place finisher Tamaki Kousaka (ToHeart), it seemed that Mai would once again fall short of her goal as Suigintou and Eri moved on. Or was it a mistake? It seems as her preliminary match ended up to be the re-telling of her high school winter-dance, as someone, maybe Sayuri and a new friend, spotted an error in the tabulation of votes. Votes were recounted, and at Eri's expense, Mai was given another chance after a 1 point victory. It didn't take long for luck to strike again, however, as Mai met her end against Haruhi Suzumiya (Suzumiya Haruhi no Yuuutsu), therefore finishing 14th. Had it not been for Sayuri and Yuuichi, who have vouched for her in the Korea Super Best Moe, not to mention a one point victory, Mai could have not received an invitation to the International Saimoe League. It was clear that she was a Cinderella of Saimoe, a beneficiary of a single twist of fate. However, in this league, with an equal playing field, Mai will continue to fight for the ones most precious to her, and with one already in this league participating with her, there is nothing she cannot do.